Ringstead is my favourite place, in the world. Quite a statement to make, especially when just thinking it and I can think of a few contenders, but no, it even beats Ke e beach in Kauai, just. I was born in nearby Weymouth and so from a very early age grew up looking longingly at the cliffs sweeping Eastwards from the bustling Georgian Town. It was landmarked by a large satellite dish for most of my childhood, and I don’t really remember the first time I visited. It has always just been very familiar. My favourite house is there too. I won’t say where, but the owners know I love it. They have no plans to ever sell it, which is now fine with me, it’s just comforting to know that its residents love it as much as I do. Yesterday my husband and I returned from a night’s stay at ‘Marren’, a gorgeous B&B tucked into the cliffs above Ringstead Bay, near to my favourite chapel, St Catherine’s in Holworth. In my opinion the small burial ground would be the perfect place to ‘Rest in Peace’ despite the unforgiving weather that it is sometimes exposed to. Marren is accessed by travelling past the ‘No Vehicles’ sign on the gate at the far end of the National Trust car park above the Bay. My poor boys were drenched on their walk as the sea mist and torrential rain did not relent and I collected two very soggy teenagers who were then rewarded by a pub meal in Lulworth. Seeing the signs had planet a seed, I was very keen to see the gardens, but knew that a busy public opening would be very difficult for me and I knew that to see the gardens I’d have to be parked very nearby. As my hubby had been away for the past two weeks, and unusually our three sons were all busy, we were free to escape for a night, and Marren had a spare room. It was meant to be! We arrived just as the sun was setting and the very steep track leading down was a great opportunity to test my beloved little Mini Countryman. The sun was setting and Weymouth and portland were looking at their best as they began lighting up against the pink sky. Our room was perfect. We settled on the larger room, with a garden view, and a doors that opened out into the garden. Garden accessed from our bedroom. We could glimpse the sea from our window and in the morning could lay in bed watching all the birds and even a pesky squirrel in the trees. 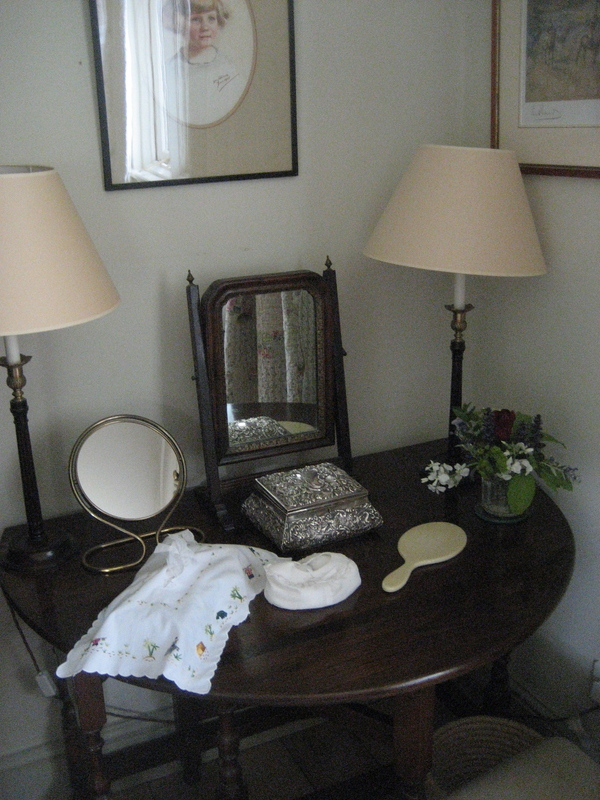 There were many interesting prints and paintings around the house,fresh flowers from the garden, lovely furnishings and gorgeous antique furniture, all without the inevitable clutter that occurs at home! Having been welcomed by Peter, out first introduction with Wendy was through the dinning room windows over breakfast. She was wrestling with a hose watering the terrace and flower beds. Under her wooly hat was a big friendly grin and she waved. She brought in the display boards of the ‘before and after’ photographs of Marren. 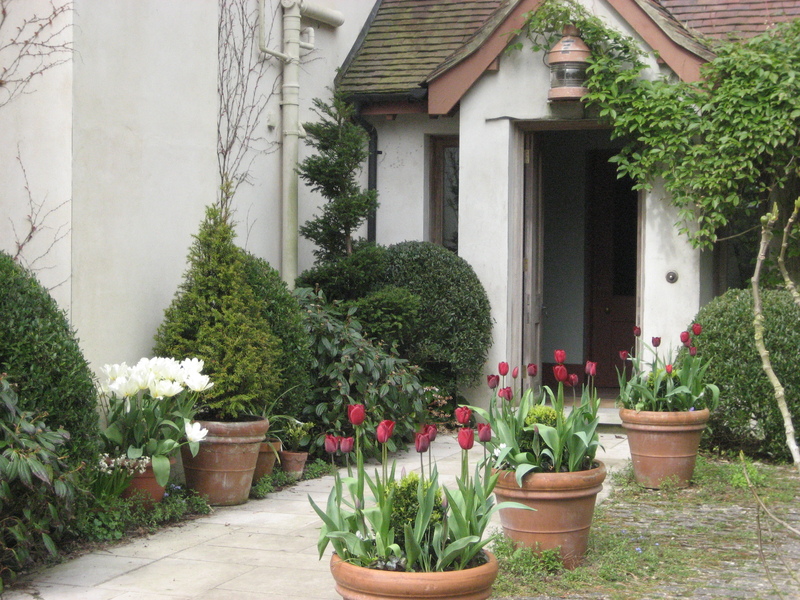 Wendy and Peter had bought it fifteen years earlier and had moved in with their children to undertake a massive modernisation of the house and then the gardens. 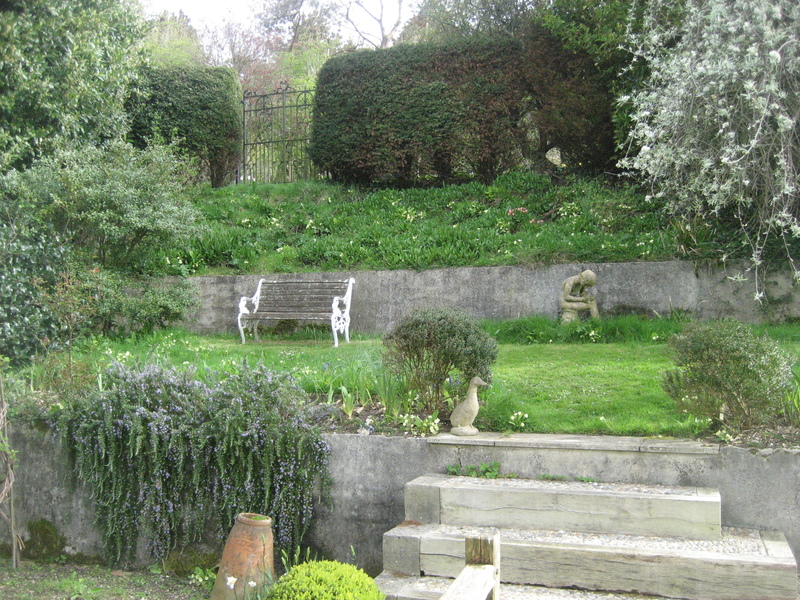 The previous owner of forty years had lived very much with the wildlife and the gardens were overgrown hiding the house andmasking the view of the sea. The house had been on the market for nearly two years and in desperation the agents had’lobbed off’ the tops of some of the trees to expose the view of Weymouth Bay. Peter had spent his childhood staying with family nearby and so had been longing to return to Dorset, as his dream house wasn’t available this was a substitute. Now it would be most peoples dream house and you can’t imagine that anyone could want more from a house or garden. 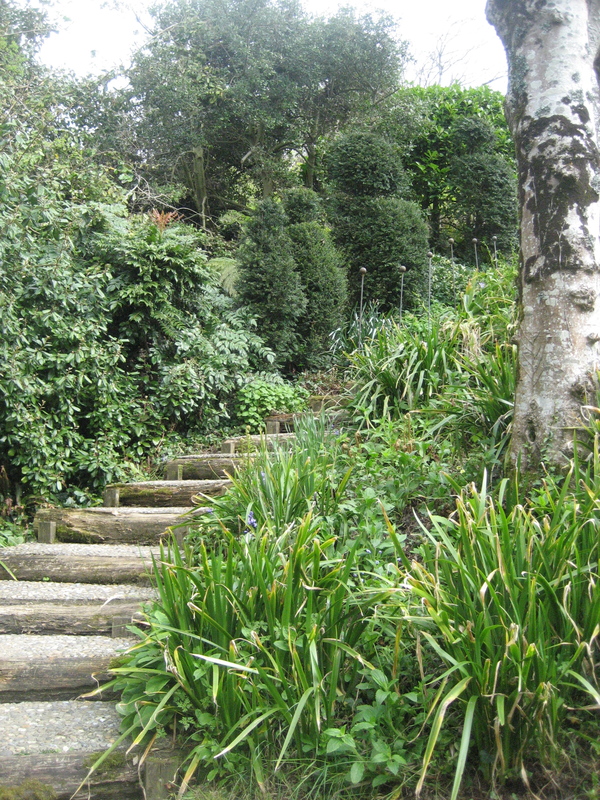 A lawn path twists through the trees and gentle steps are built into the landscape leading you through and into new ‘rooms’. Badgers,Deer and more reluctantly, squirrels have free run of the gardens and are particularly fond of the willow arch at the lowest part of the garden. It’s had to be re built several times! It was perfect for us to be there all alone and I highly recommend viewing the gardens during a stay at Marren. This did mean sadly that we didn’t get to try the tea and cakes that the NGS visitors would enjoy! We spent over two hours enjoying the gardens and bought a couple of the White Iris to bring home to our garden. A little bit of Ringstead for me to enjoy throughout the year. It ‘s owned by a Weymouth chap who grew up in the same street as my father, so I like that connection, it makes me feel a little more like a local! They do the best fish and chips so we sat in the sunshine watching all the families arriving and carrying their clobber down to the beach. 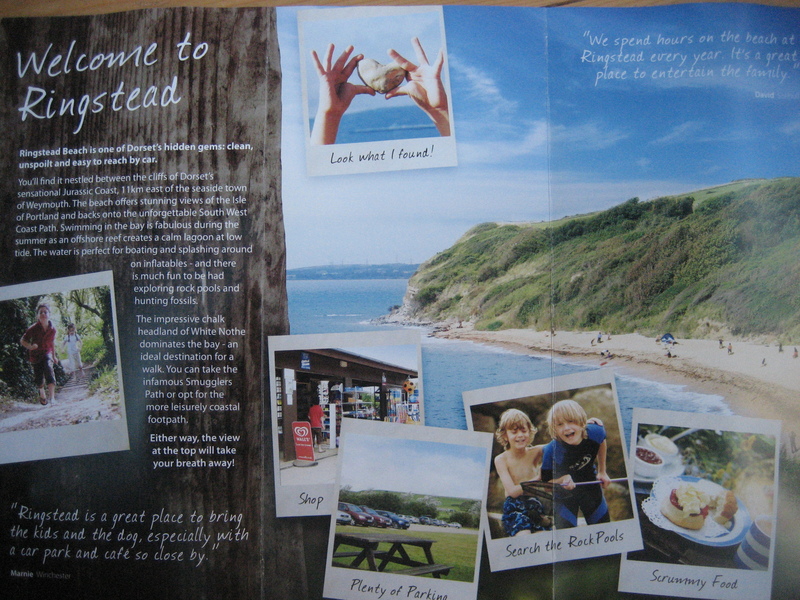 ( It’s a short five minute walk to the pebbly beach from the car park) The cafe also has a shop selling EVERYTHING! Ringstead has a small caravan site and lots of holiday cottages and so the shop caters for walkers, children, and every kind of sea activity, even wetsuits. The previous week my boys had chips and a bag of Moores ‘Dorset Knobs’ to fuel their walk. 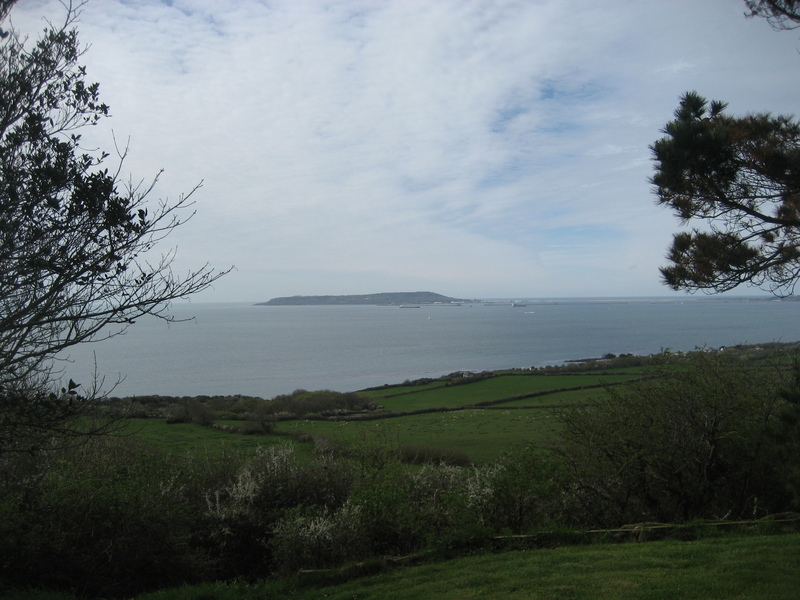 It’s a great spot for people watching, large ‘city families’ with their Range Rovers who rent the holiday homes, and then at the other end of the scale the families who’ve walked to Ringstead from the large camp site at Osmington Mills, the Boat owners and the Ramblers. Then people like us, reasonably local so able to visit for the day or an afternoon. The beauty of Ringstead and Holworth is that it is and remains a very special place. It’s somewhere that people return to again and again, a well kept secret haven which is why I’ve not written about it before, I don’t want it spoiled. I did learn something fantastic yesterday though. Apparently a while ago some big camp site owners were looking at the fields that surround the area, talk of a large Butlins or Haven were going around. A wonderful person then bought up all the surrounding fields and gave them to the National Trust. That is the kind of thing that should be making headline news rather than all the pessimistic doom and gloom. How wonderful and selfless to do such a thing, ensuring that a place special to them should remain so, with it’s wildlife and sweeping countryside all protected so that i know that my children and their children will be able to visit Ringstead and see just what I see now. So if you read this and decide to go, treasure it, take time and smell the air, watch the birds, enjoy the views and definitely try the chips!